***Shipping is extra. Please contact the artist for a quote on shipping. I took a mixed media workshop using acrylic inks on watercolor paper. 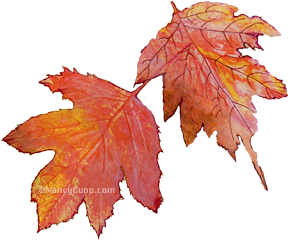 I experimented with some maple leaves I found in the yard and used it in this painting. 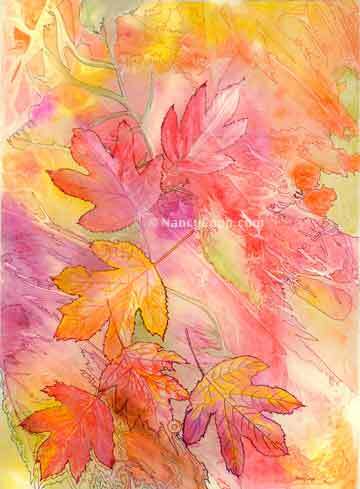 I allowed the various colors to flow on the paper, placing leaves here and there and let them interact with the acrylic ink. The leaves left these impressions in the ink. Daniel 9:12 Its leaves were beautiful and its fruit abundant, and in it was food for all. The beasts of the field found shade under it, and the birds of the heavens lived in its branches, and all flesh was fed from it.